Our 2019 two-day Conference will be held on the Keynes College Campus of the University of Kent, on the edge of Canterbury, looking down towards the City and its Cathedral. There is ample parking for cars. The nearest train station is Canterbury where taxis are available. The campus is also readily accessible by bus. Our member, Nicholas Markwell’s personal guidance on Public Transport options is again available: Please contact the Secretary on our contact page to be put in touch with Nicholas. Conference begins Tuesday 23rd July (Registration from 2.00 pm) and concludes with lunch Thursday 25th July. Accommodation is single with a few twin rooms available; all are en-suite. The Conference Pack, including the Conference Programme, a list of those attending, and other papers, will be sent out early July. Our Chaplain will be Revd Adam Carlill. The Festival of Hymns will be in Canterbury Cathedral’s Western Crypt: Commentator, Janet Wotton; Organist, John A. W. Webber; Conductor, John Bell. 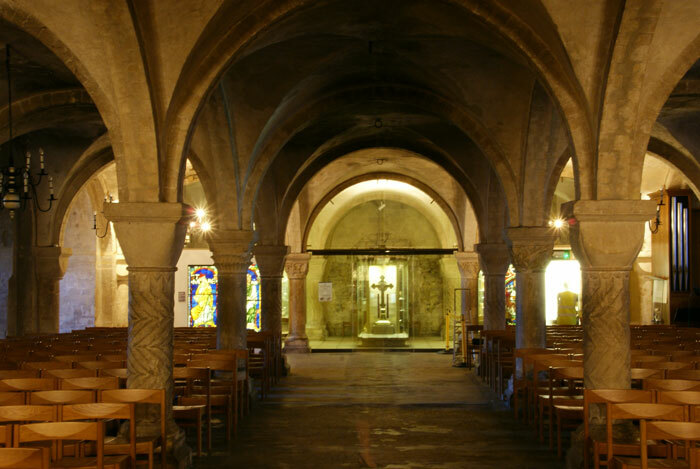 The Crypt dates back to the 11th century and is the oldest part of the Cathedral. Its architectural style is very different from the rest of the Cathedral. Round arches, beautiful carved capital and decorated columns are typical of Romanesque (Norman) architecture. John Bell: Whatever Happened to Jesus in the Church’s Song? There will be three Sectionals (30 minutes) and a Short Metre Session (10 minutes each participant). If you would like to be considered for a contribution to Short Metre please contact the Secretary. The cost for residents is £240.00. Non-Members will be charged £260.00 but receive 12 months membership of the Society. The cost for day-visitors for the full conference is £146.00, charged pro-rata according to length of stay and events on each day (see back page of form). Accommodation for additional nights either side of the conference is available: Bed and Breakfast £46.00 per person. Dinner on Monday night is an additional £10.50. Those staying Thursday night may purchase dinner for themselves in the dining room. When booking, please state all your requirements clearly. A limited number of bursaries are available for those who would otherwise find it difficult or impossible to attend. The Secretary can provide further information regarding applications for bursaries, should be made by 31st March.